Specific identification method can be applied in situations where different purchases can be physically separated. 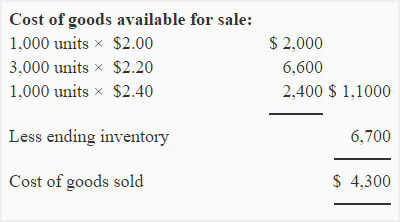 Under this method, each item sold and each item remaining in the inventory is identified. The cost of specific items that are sold during a period is included in the cost of goods sold for that period and the cost of specific items remaining on hand at the end of a period is included in the ending inventory of that period. The 3,000 units in the inventory on April 30 is composed of 500 units from purchases made on April 01, 1,500 units from purchases made on April 12 and 1,000 units from purchases made on April 30. Required: Calculate the cost of ending inventory and the cost of goods sold using specific identification method of inventory valuation. This method is ideal in situations where small number of easily distinguishable items (such as jewelry, automobiles, handicrafts and furniture etc.) are handled. The main advantage of this method is that, flow of cost corresponds to the physical flow of inventory. In other words, actual costs are matched against revenues. The main disadvantage of using specific identification method is that, the net income can be easily manipulated under this method. For example, if an identical item is purchased early in the year at different prices, the items from the highest or the lowest priced lot can be selected to be delivered to the customers with the intention of income manipulation. What below statement is recognized as a disadvantage. If the profit is low, then we can select the lowest priced lot to be delivered to the customer and vice-versa. It is true or I understand the statement wrongly. Please advise. You are correct. Actually, it is a drawback of specific identification method. Really that was good for my class was getting difficult. Weeeee, what a quick and easy sonuitol. Thanks a lot it helped me to understand the topic briefly ??? we use this method as our store is a bridal boutique. each item is barcoded and has its own cost associated and sku’s, etc. so cogs is accurate and not manipulated as it’s based upon actual item sold and its sku. I don’t know how it can be manipulated if used under those principles.